Stamping friends, I know that I’m here in Canada on the British Columbia West Coast, and safe from the devastating wildfires in our interior. I’m also safe from the devastation of Hurricane Harvey and Hurricane Irma. However, I’m not without empathy, and sympathy, for those enduring these awful times. 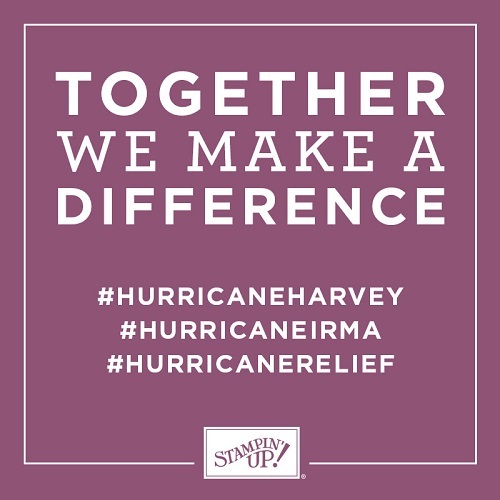 It’s now that we can help make a difference – and Stampin’ Up! is dedicated to help as well. Along with many of you, we are watching with concern as stories unfold about the devastation left behind in Texas and Louisiana by Hurricane and Tropical Storm Harvey. Though no one knows how many lives have been affected, Harvey is said to be one of the worst natural disasters in U.S. history, and the damage caused by massive flooding will be felt for years to come. With you, we’re also trying to stay informed on the progress of Hurricane Irma; as we write this, Irma has not yet made landfall but is currently classified as a catastrophic Category 5 storm. It will almost certainly leave as much destruction in its wake as Hurricane Harvey and will affect the lives of tens of thousands of people. As a Stampin’ Up! family, we invite you to help us give to those who are now (or will soon be) trying to rebuild their lives. From now until the end of October, Stampin’ Up! will match donations made to the American Red Cross, dollar-for-dollar, for up to $50,000. Please click here to donate. The Stampin’ Up! community is already making a difference through ongoing hurricane relief efforts. Here are some ways people are raising money. Demonstrators are donating a portion of their commissions. Demonstrators are holding dedicated events, including retired product sales, where all proceeds are being donated to hurricane relief. Customers are being invited to donate at events. Demonstrators are selling unused cards or are mounting past swaps on card bases and selling them (in accordance with the Angel Policy) to raise hurricane relief funds. If you’re a Stampin’ Up! customer and would like to help, reach out to your demonstrator and see if they are holding any fundraising events you can be a part of, or click here to donate to the American Red Cross. Together, we can do incredible things! We hope you’ll join us . . . because we truly can make a difference. Of course, every bit helps! No matter the size of your donation, or whether you choose to donate to a different charity – all will be helpful! Some prefer to donate to organizations such as Samaritan’s Purse, Habitat for Humanity, and of course we can’t forget all of the animals also affected – the ASPCA, Best Friends Animal Society, to name a couple, would all welcome donations. We also can’t forget our U.S. friends here on the West Coast, in Washington, California, Oregon, Montana and in Utah. Remember – the matching of donations applies to donations made to the American Red Cross. So Canadian friends, and friends around the world – please use the link provided above to ensure your donation goes to the right place, and that Stampin’ Up! will be aware of it and match it.